For a heart-pounding, adrenaline-charged adventure, grab a paddle for white-water rafting down one of Central America’s most exciting rivers. 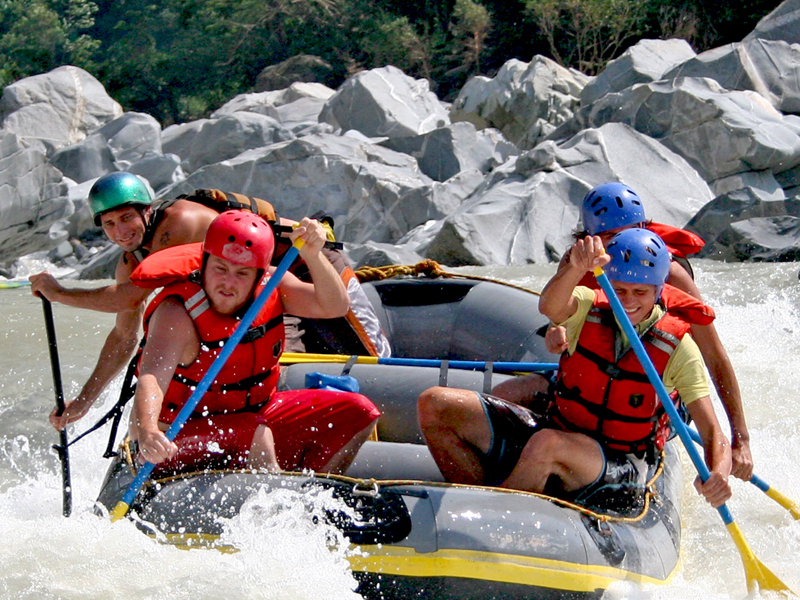 Whether your itinerary takes you to Costa Rica, Honduras or Niracagua, high-energy thrills await on the roiling rapids. Río Balsa, a thrilling part of the Arenal experience. Combine white-water adventure with wildlife viewing as you paddle down fun, churning rapids on the scenic Río Balsa, a spectacular river near the base of the iconic Arenal Volcano. Challenge yourself as you slice through 10 kilometres (6.2 miles) of continuous rapids with names like Congo Loco and Rock around the Croc, and the more challenging Las Dragas stretch. Navigate roughly 30 rapids (Class II and III) in this escapade down a scenic, rainforest-shrouded river. Along calmer segments, get an eyeful of birds, butterflies, and animals that make their home in the forest surrounding the river. You’ll spot monkeys, sloths, iguanas, and tropical birds, such as ospreys, toucans, oropendolas, and more. Take a refreshing dip in one of the natural pools that flow in docile stretches of the course. In the Atlantic region of Costa Rica, the Pacuare flows within a protected zone of incomparable beauty flanked by steep, green walls. Start by enjoying the calm, peaceful setting, connected with nature, then brace for excitement as you raft through the verdant rainforest and down one of the most spectacular rivers in the world. Journey through the pristine ecosystem and its dense vegetation, all on a river that boasts some of the finest rapids in Central America (Class II and Class IV). Along calmer stretches, take in the breathtaking scenery and wildlife, including toucans, parrots, and other tropical birds. Towering trees and crashing waterfalls form an incredible backdrop for this exhilarating run. Río Sarapiqui, where the whole family can participate. A scenic river located deep within the northern Costa Rican rainforest, the Sarapiqui flows through a beautiful setting of vines, multicoloured wildflowers, and soaring, verdant mountainsides. With its wonderful variety of curves, turns, and descents, the river offers stretches suitable for families and novices to enjoy (Class II). Rafting veterans can test their mettle on its many fast-paced runs (Class III and IV), which have names like the Terminator, the Pipeline, and Dos Locos. Known as the Jungle Run, this heart-pounding stretch offers a wild ride for adrenaline junkies with experience on challenging rafting destinations. Along calmer stretches, look for crocodiles, river turtles, iguanas, wading birds, monkeys, toucans, and parrots among other exotic species. Río Savegre, one of the most pristine rivers in Central America. Surrounded by lush vegetation in Costa Rica’s central Pacific region, the Savegre River is the ideal rafting destination where relaxation and pure adrenaline come together. Featuring Class II, III, and IV rapids, the river offers meandering waters, ideal for beginners, with increasingly turbulent stretches for moderate to challenging action-packed rides. With names like Piñata, Devil’s Mouth, Rollercoaster, and Gringo Eater, the rapids deliver the thrill of a lifetime. The river cuts through canyons with stunning lush landscapes, vivid wildflowers, and incredibility biodiversity. Toward the end of the run, river waters become calm and easy, allowing you to take a closer look at birds (kingfishers, egrets, cormorants, osprey, toucans, and parrots, to name a few) and rainforest vegetation. A jungle-shrouded river in northern Honduras, the Cangrejal tumbles down from headwaters deep within Pico Bonito National Park near La Ceiba. Along its 32-kilometre (20-mile) course to the Caribbean Sea, the Cangrejal (river of crabs) offers something for everyone, from beginners to world-class, white-water veterans (Class II to Class V levels). Start out by floating through a friendly stretch that leads to winding, challenging runs that feature steep drops and long wave trains. The twists, turns, and drops will have your heart pounding and shoulders aching from maneuvering around huge boulders. When the paddling returns to a leisurely pace, enjoy the impressive scenery, including cascading falls and gurgling pools against a backdrop of lush, rainforest growth lining both sides of the river. Along the way, hop out, climb up one of the boulders and plunge in! Originating in Lago Apanás, Nicaragua’s third-largest body of water, the Tuma delivers 15 kilometres (9.3 miles) of adventure and nature, spiked with a lot of adrenaline. Start out with serene, leisurely rafting, enjoying the birds, monkeys, and other wildlife that thrive on the riverbanks and in the treetops. Get ready for some hard-charging paddling as the river descends and the flow accelerates. The rapids change from intermediate (Class II and III, suitable for less-experienced rafters) to challenging runs (Class IV) with sharp turns and steep drops to challenge veterans. One of the most famous rivers in the country, the Tuma eventually flows into the Caribbean Sea, becoming the Río Grande de Matagalpa along the way. *Balsa River, Pacuare River, Sarapiqui River, Savegre River & Cangrejal River videos used in this article are not Viaventure’s property, they had been originally published in Youtube. Satisfy your sweet tooth while experiencing wonderful elements of Maya culture as you visit traditional chocolate workshops. Designing tailor-made experiences for Central America travellers since 2001, Viaventure goes the extra mile to exceed our guests’ expectations at every level, from creative itineraries to dining and lodging choices.